Median value increased from 2004 - 2006. From 2006 to 2007 values decreased. Following the 2008 financial crisis values decreased from 2008 - 2010. From 2010- to 2014 values have increased an incredible 71%. Appreciation has been driven by increasing rents, strong investor and developer demand, and decreasing inventory. 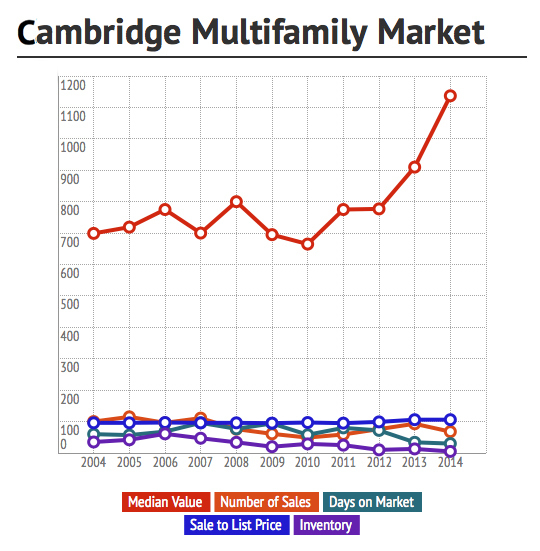 Investors are willing to accept low capitalization rates (in the 4 range) for the perceived security and growth potential of Cambridge. The number of sales in the past 10 years was highest in 2005 with 115 sales. The lowest number of sales was 49 in 2010. In spite of lower inventory sales have increased, peaking at 93 sales in 2013. The average number of days on market (DOM) was 60 days in 2004. As the market weakened in 2007 the average DOM increased to 96. As inventory has decreased, days on market has steadily decreased, reaching a low of 30 days in 2014. Sale prices relative to list prices stayed in the 95% - 97% range from 2004 - 2011. As inventory declined and demand increased in 2012 the ratio increased to 99%. As inventory declined further in 2013 and into 2014 the ratio jumped to an unprecedented 106% in 2013 and 2014. The number of units on the market was 35 in 2004. The number of units on the market peaked in 2006 at 61. By 2010 the number of units had shrank to only 10. In 2013 the number increased slightly to 13, but then shrank to 10 in 2014. Demand has outstripped supply for the past several years leading to dramatic appreciation in values. The multifamily market has been in an appreciating cycle since 2010. The current market is a seller's market with historically low inventory levels. Demand is exceeding supply with multiple (often cash, no contingencies) offers significantly over asking price occurring frequently.